Similar to the national flag, red flag with white disk containing the crescent and star (apparently somewhat smaller than in the national flag) and above the disk in yellow Arabic letters inscribed "Li-l-watan," meaning "For the nation". There is a golden/yellow fringe along the three outer edges. A red ribbon is attached to the flag pole above the flag, fringed golden at the short edge and with a white disk with crescent and star near the fringe. The Tunisian defense attaché in Washington said this flag used to be displayed by all commanders in the armed forces, but is now limited to the President. I would surmise that it represents his capacity as commander-in-chief of the armed forces. At http://www.defenselink.mil/photos/Oct2000/001007-D-9880W-053.html is a recent photograph of President Ben Ali meeting with U.S. Secretary of Defense William Cohen with two flags along the wall. 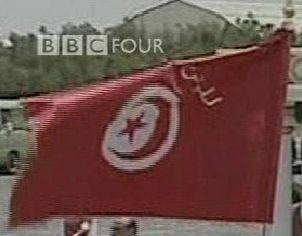 One is a fringed version of the Tunisian national flag with an Arabic inscription in white in the upper hoist. I have seen this flag in Tunisian military offices during previous visits; as I recall, the inscription reads "li-l watan" (for the nation) [the -tan portion is visible in the photograph linked above]. The other is bluish-violet with an Arabic monogram surrounded by an olive wreath, all in silver. The monogram appears to consist of two letters, one of which is a "jim" (transliterated in English as j). The other may be a "ta", which would suggest a monogram for Al-Jumhuriyah at-Tunisiyah, (the Tunisian Republic), but I can't tell for sure. An interesting feature is that both flags are topped with short cravats with miniature versions of the devices on the flags. Does anyone have any further information on these? I wonder if the purple or dark blue flag in this picture might not be the actual presidential flag of Tunisia. If not, I don't know what it is--the photograph was taken in President Ben Ali's office, I believe, and is obviously part of a matching set with the modified national flag that we've assumed to be the flag of the President. I've seen the national flag with inscription at the Tunisian ambassador's residence in Washington and asked the Tunisian military attaché what it was--he said it used to be the flag of army units but was now the president's flag, which didn't really explain what it was doing in the ambassador's residence, of course. I wonder if the national flag with the slanted inscription (which reads "lil-watan," i.e. "for the nation/pour la patrie") might not be some kind of ceremonial national flag--possibly the national *color* and the dark purple/blue flag the president's personal flag. The only letter of the Arabic monogram that I can make out in the picture is a "j", which could stand for the word jumhuriya, meaning "republic." The emblem as replicated on the mini-cravat at the top of the flag. It appears to me (maybe Dov can give his reaction) to be a "tughra"-style monogram of the letters R and J, which could conceivably stand for "ra'is al-jumhuriyah," i.e., "president of the republic." This dark violet flag must be the presidential flag because it was also used by the president on an official trip to Morocco. It was reported by Jose Luis Cepero (then living in Morocco) and published in Flag Report about one year ago. A correction adding the wreaths (missed by Cepero in his first report, but noted in a second observation on Moroccan TV) and correction of some details in the emblem is due to be published next year. Perhaps the other flag is the flag of the supreme commander of the armed forces, who is also the president? I did a search on "+president +tunisie +drapeau" and found, inter alia, www.carthage.tn. This site is a record of the President's doings and sayings. At www.carthage.tn/html/lepresident/photos/index.html is a set of photos, none of which contains the violet/blue flag with the monogram -- surprising if it is the official presidential flag. On the other hand, at www.carthage.tn/html/activites/2004/05/26/a1.html we have a photo of the President being presidential, with both the national flag with inscription and the blue/violet flag. Looking at all these pictures I have noticed something odd: the symbols are arranged so that they appear vertical on a flag hanging down on an indoor pole, i.e. with the lower fly corner straight down. In other words, the symbols are placed *diagonally* on the flag. This applies to both the monogram on the blue/violet flag and the national emblem and inscription on the national flag. This might suggest that Željko's original gif above was correct, and the "presidential" flag (as we call it) does have the inscription horizontal and that what we are seeing in the photos is a ceremonial version of the flag for indoor use with *everything* rotated. However, the TV capture here of the flag flying outdoors clearly does show the national symbol as we would expect it and the inscription set diagonally. So there are two versions of this flag. The background image on the www.carthage.tn site shows that the letters clearly are Arabic R and J, each with an ornamental "tail" looping over the top. Is it my monitor, or does the inscription on the national flag, "al-watan" look more white than gold? It is not just your monitor. And a somewhat clearer image at http://www.alkhadra.com/basicdata/index.html also has the inscription looking more white than gold to me. Album des Pavillons (2000) shows the fringe as gold, but Smith (1975) shows it white. Maybe it varies, or has changed? To help resolve the question of this flag's identity, it is mentioned above that the inscription on the flag could not be read in its entirety. Two very clear images giving a good view of the inscription can be seen at http://www.benali.tn/images/logo.gif and http://www.carthage.tn/html/index.html. The first is a logo combining elements of the purple flag with the Tunisian flag and the second is from the official website of the President of the Republic of Tunisia. Also on that website, if one clicks on the Flash presentation and then clicks on the President link and selects either Biography or Oeuvre one finds the inscription on purple used as the background. 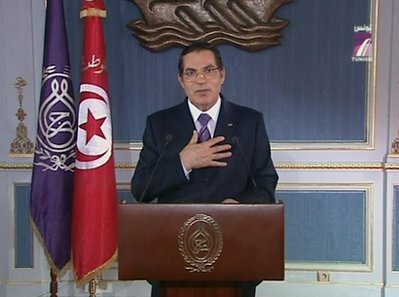 The violet flag that can be seen in the back of the President is the Tunisian "presidency flag"; It is not a personal flag. On the flag are represented the two Arab letters "ra"and "jim" for "riesset al jumhouriya" for presidency of the republic. If it was "president", it should be "rais". The red flag is the president's flag. On a television news report I saw an image of President Ben Ali with two flags - they appear to be the Presidential flag and the mysterious purple flag that was reported in 2004. I have found a still of this photo on Yahoo News. It is stated to be taken at a speech in Tunis on 13 January 2011. Perhaps the purple flag is a personal presidential flag and the red is the rank flag of Commander in Chief. The red flag appears to be similar to the presidential flag except that the inscription is white not yellow. According to Album des Pavillons (2000) (correction 5), this blue-purple flag is Presidency flag. The flag on the picture you sent is the newer version including letters R and J, flanked by a wreath. It means ra'is al-jumhuriyah (President of the Republic). The former version included three letters R, J and T, latter probably with meaning Tunisia. I have found a picture taken on February 11, 2006 in Tunis with the former version at http://www.life.com/image/56825512. The current presidency flag (or it was during the realm of ousted president Zine El Abidine Ben Ali) is shown above. The main flag itself is indeed the red flag with the "For the Nation" inscription. In the same 1999 law that gave the dimensions (but not the colors) of the flag, gives the president "intended use" of this flag at http://www.businessnews.com.tn/Les-dispositions-l%C3%A9gales-du-drapeau-tunisien-ne-sont-toujours-pas-respect%C3%A9es-par-la-pr%C3%A9sidence-,520,45753,3 (Article 3, la loi organique n°99-56 du 30 juin 1999). There was no mention of this violet flag in this law, but many of times executive flags are designed by other laws or decrees. emblem, which I have now identified as the presidential seal based on the official Facebook page of the Tunisian President (https://www.facebook.com/Presidence.tn/; the main website for the president turns up unavailable and password protected). The flag from what I can tell, it is more purple (like Tokyo, Japan, flag purple) and with the symbols being in gold. The israj.net link makes it look like white, but this last point will make everything almost moot. This version is based on Smith (1982) with a white disk being approximately 1/3 of the hoist.